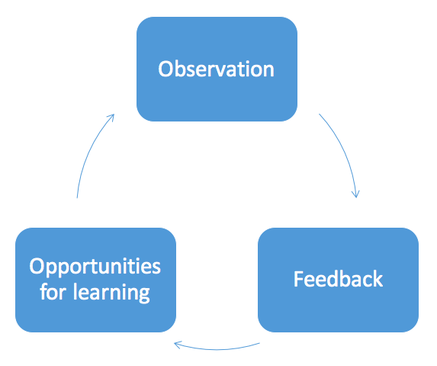 ​We view supervision as an iterative cycle that includes: Observation, Feedback and Opportunities for Learning. We seek to support leaders in their work with teachers as they promote a growth mindset, foster frequent and ongoing opportunities for feedback, sustain a commitment to teacher development over time, and engage in collaborative practices. BUILDING TRUST: Leaders work closely with teachers to develop trusting relationships with the goal of fostering support and growth, rather than enforcement. Successful supervision is modeled after the teacher-student relationship as opposed to the boss-worker relationship. COLLABORATION: Leaders partner with teachers, and teachers partner with one another to develop expertise as a community. Teacher learning opportunities aim to build shared knowledge and reward growth across the school. TRANSPARENCY: Leaders seek to make their approach visible to teachers. Sharing protocols and processes, leaders ensure that teachers are not surprised by their supervision practices and engage in open conversation about the process. TEACHER DEVELOPMENT: Leaders believe teachers can develop new practices and expertise. Furthermore, they seek to support teachers’ ongoing learning activities. The design of these activities takes into account the career stages and expertise of teachers, differentiating as appropriate to ensure that all teachers continue to grow.